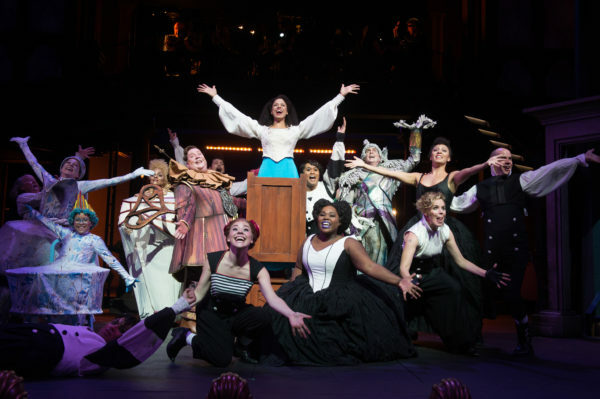 Belle (Jennie Greenberry, center) leads the ensemble in song in the Oregon Shakespeare Festival's 2017 production of 'Disney's Beauty and the Beast' (Photo by Jenny Graham). Belle (Jennie Greenberry, center) leads the ensemble in song in the Oregon Shakespeare Festival’s 2017 production of ‘Disney’s Beauty and the Beast’ (Photo by Jenny Graham). “A tale as old as time!” As Belle and her beloved Beast dance ever so slowly, Babette the feather duster (Robin Goodrin Nordli) sings the iconic song and fulfills her full duty as an unspoken (well, albeit still very talktative) narrator throughout the Oregon Shakespeare Festival’s 2017 production of “Disney’s Beauty and the Beast.” The beautiful outdoor Allen Elizabethan Theatre — with a sign outside proudly pronouncing it America’s first Elizabethan Theatre — is simply a marvel in and of itself. As the sun began to set through the first act, basking the stage in a warm orange glow, I felt rather transported to another world — and having such a famous tale enclosed in the dark brown, rustic wooden space only added to this. The performance area occupied a rather wide portion of the ground level of the theater, while the orchestra sat on the second and a hidden third level for eagle-eyed viewers who may have spotted the Beast up there on occasion. A staircase connecting the first and second levels handily served as a multipurpose set piece up to the library, out of the castle and even transformed into the stairs down for the iconic dance scene. Belle (Jennie Greenberry) and the Beast (Jordan Barbour) each brought a magical quality to the production, adding a strong confidence to their respective characters (Belle’s own attitude being very forward with a feminist quality, the Beast’s a headstrong anger deriving from his own self-loathing). At the same time, comedic bits — a well-placed shrug here, a minor break from the character molds so carefully created — added a relatable charm to the characters, slowly blending with the animated castle pieces, including the wonderful candlestick Lumière (David Kelly) and grandfather clock Cogsworth (Daniel T. Parker). Seeing as many school groups filled with young self-proclaimed theater geeks attend the Oregon Shakespeare Festival and specifically this production, it was great to see that both Belle and the Beast were played by black actors, while Gaston was played by an Asian American actor. Such a normalization of a diverse cast is delightfully commendable, despite the somewhat alarmingly white audience demographics (OSF’s 2010 Audience Development Manifesto states that “people of color currently represent roughly 10% of of [its] audience, but are more heavily represented in [its] student groups.” OSF goes further in stating that it will continue to both work to improve ethnic diversity in its audience as well as practice color-conscious casting for its productions). To this end, awareness in both casting and audience makeup will be crucial in OSF’s continued success, especially with the almost overwhelming number of students who come to see productions, many unsurprisingly further inspired to pursue arts and theater in the future. Gaston (James Ryen, center) is serenaded and cheered on by the ensemble (Photo by Jenny Graham). Nevertheless, overt racial awareness in theater is often not what draws younger attendees to such a musical. Plenty of small quirks set the Oregon Shakespeare Festival’s production of “Beauty” apart from the rest, adding a wonderfully unique, imaginative quality built to entrance the audience members and draw them into the fairytale world. A female Lefou (Sara Bruner) provides a fantastic comedic contrast in both physicality and vocals to the towering, deep-throated Gaston (James Ryen). Clever theatrical tricks — a distraction here, a cloth blocking an actor there — allow transformations such as the Beast into a prince and Belle’s unseen entrances to ascend to near-magic. Frequent first-row audience interaction provides a playful yet non-interruptive way to break the fourth wall with hysterical results. Repetition of the opening announcement (“Welcome to the Oregon Shakespeare Festival, etc.”) at sporadic points throughout the production adds a strange yet storybook-like quality with increasingly hilarity as audience members are told that they will, in fact, be seated at the back of the theater if they leave at any point — for the third time. It feels bizarre and at first almost like a mistake, as the audience laughs awkwardly, but somehow brings a surreal comedic feel to the otherwise conventionally-based story. Directed by Eric Tucker, the simplicity yet effectiveness in design was key in such a complex production, especially with so many moving parts, from the more absurd comedic additions to the sheer quantity of actors. A red jacket efficiently differentiated Ryen as Gaston from Ryen as one of the animated castle objects, while performers acted as parts of machinery and virtually everything else, yet little was lost in translation. The interpretive movements of the ensemble (choreography by Erika Chong Shuch) gave it a fantastical feel without compromising comprehension of the plot, even for the youngest of audience members, who seemed delighted by much of the physical humor. With these creative additions to this tale as old as time, OSF’s ‘Disney Beauty and the Beast’ is truly worth it. 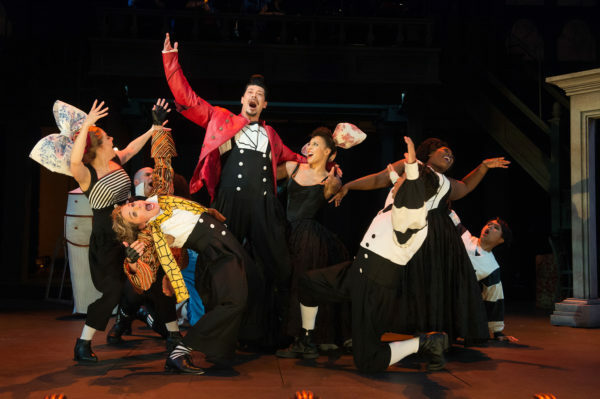 “Disney’s Beauty and the Beast” will be performed at the Allen Elizabethan Theatre until October 15 at the Oregon Shakespeare Festival in Ashland, Oregon.